One Touch HD Movie Recording. Staying connected means sharing life’s happiest and most poignant moments with people you care about—and HD movies do it well. The COOLPIX S4100 is the full-featured camera you’ll want for shooting high quality HD 720p movies. With One-Touch recording, movie making has never been easier. Digital zoom allows you to get close to the action whether you’re at sporting events, beach parties, or music concerts. And since the compact COOLPIX S4100 has pull-from-your-pocket, easy-to-carry convenience, you can shoot college graduations, birthday toasts, and other once-in-a-lifetime events discreetly, so the action is always spontaneous and memorable. When your movie is complete, watching and sharing it is also simple, with in-camera playback. Or, you can opt for playback on your TV or computer. First it turns heads… then it shoots their pictures. With its rounded body and sleek lines, the ultra-light COOLPIX S4100 sells itself on looks alone. It comes in three colours, plum, black, and red, which makes it a favourite choice of the stylish and design conscious. But while this camera is full of personality, it’s also packed with versatile Nikon features that make it an ideal everyday camera. 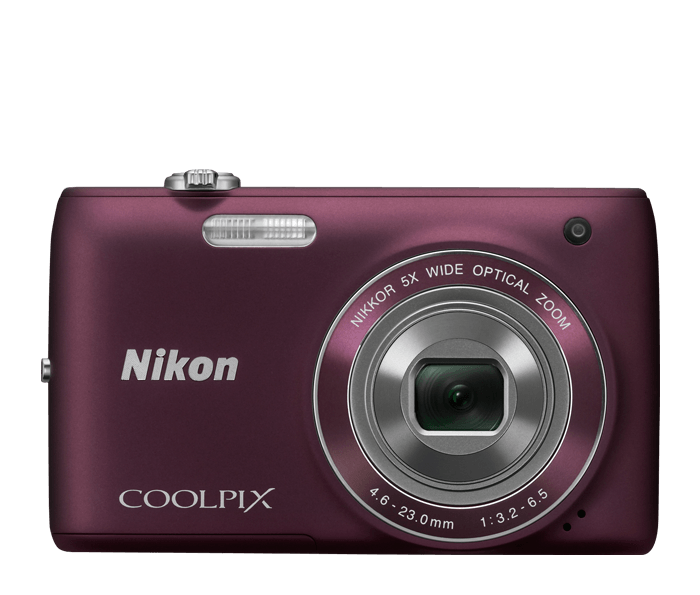 Slip the COOLPIX S4100 into your purse or coat pocket. At 20mm thin and a feather weight 131g, you’ll hardly know it’s there, and yet it’s ready to shoot high quality stills or HD movies at a party, on the beach, or at a ballgame. You live life in high gear. You deserve a camera that keeps up with you every step of the way. High Quality, High Resolution Touch Display. If you love fingertip operation with a cool, intuitive graphic interface, wait ‘til you start taking photos with the COOLPIX S4100. The camera’s clear, bright, three-inch touch LCD monitor comes alive with 460,000-dot detail. In shooting mode, Touch Shutter lets you choose a focus point simply by touching any part of the frame. There’s also Touch AF/AE (Auto Focus/Auto Exposure) for convenient auto focus by touch. Plus, with Subject Tracking, you can touch any subject on the display and the COOLPIX S4100 will follow it through the frame. The COOLPIX S4100 provides touch control in playback with features such as Paint Functions and Slide Show, which offers fun “character” effects and Image Scrolling. The COOLPIX S4100 is also equipped with several filter effects that let you add a personal touch to your photos and include Soft Focus, Selective Colour, Color Options, Fisheye, Miniature, and Cross Screen. Take great stills and movies with a powerful photo partner. The COOLPIX S4100 may be stylish, slim and compact, but it also has plenty of power. Nikon has equipped it with a 14.0-megapixel CCD sensor that assures exceptional image quality. It’s paired with a 5x wide-angle optical Zoom-NIKKOR glass lens that offers you excellent compositional freedom. Nikon’s true glass lens boasts a focal length from 26-130mm, a range that zooms in for your best portrait shots and has a wide angle to cover beautiful landscapes. The COOLPIX S4100 even has 20 Scene Modes, including Scene Auto Selector, so you can leave it to this intelligent camera to automatically determine what type of photo you’re taking and adjust the setting to assure a flawless photo every time. And just when you think this camera is maxed out with features, its formidable movie recording capabilities capture all the action in 720p HD. Hassle-free Nikon technology produces great shots every time. Imagine an affordable, compact camera that’s also smart enough to automatically correct for camera shake, take a series of shots and save only the sharpest ones, or intuitively adjust shutter speed when you’re focused on moving objects. The remarkable COOLPIX S4100 does all that and much more. It’s equipped with a four-way Electronic VR Image Stabilization system that minimizes blurred images. Its Motion Detection identifies moving objects and adjusts both shutter speed and ISO to create optimal settings to achieve the best picture. With the COOLPIX S4100, Nikon has thought of everything. When you’re shooting in low-light, you’re sure to get optimum results with high ISO speeds up to 3200. For both still images and movies that are sharp and clear, count on EXPEED C2 to heighten fine detail and image quality—and do it all with exceptional processing speed. This innovative camera is ready to take on your imagination. Not only is it equipped with 20 Scene Modes that automatically adjust camera settings to assure optimum results for specific scenes, but also comes with new PET Mode feature. In this mode, it finds and focuses on the face of a dog or cat. The COOLPIX S4100’s Smart Portrait System includes Smile Timer, which automatically recognizes when a subject is smiling and releases the shutter. Face-Priority AF finds and focuses up to 12 faces. Blink Warning alerts you when your friends may have blinked. What’s more, in-camera Red-Eye Fix corrects most instances of red-eye, while Skin Softening smoothes skin tones. The COOLPIX S4100 also has macro shooting capabilities as close as 10cm, and a supplied EN-EL 19 Li-ion rechargeable battery for approximately 190 still shots.